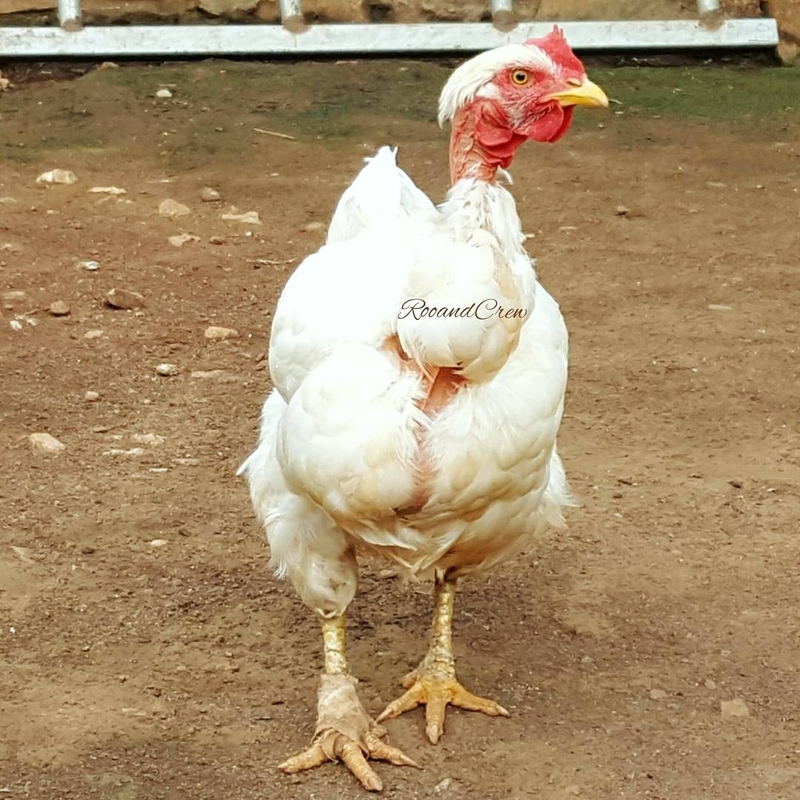 Marvel is a white female turken (naked neck chicken breed) who lives in Uganda, East Africa. Tino rescued Marvel from a chicken market---he had been keeping an eye on the little bird since he had first spotted her a couple weeks ago. 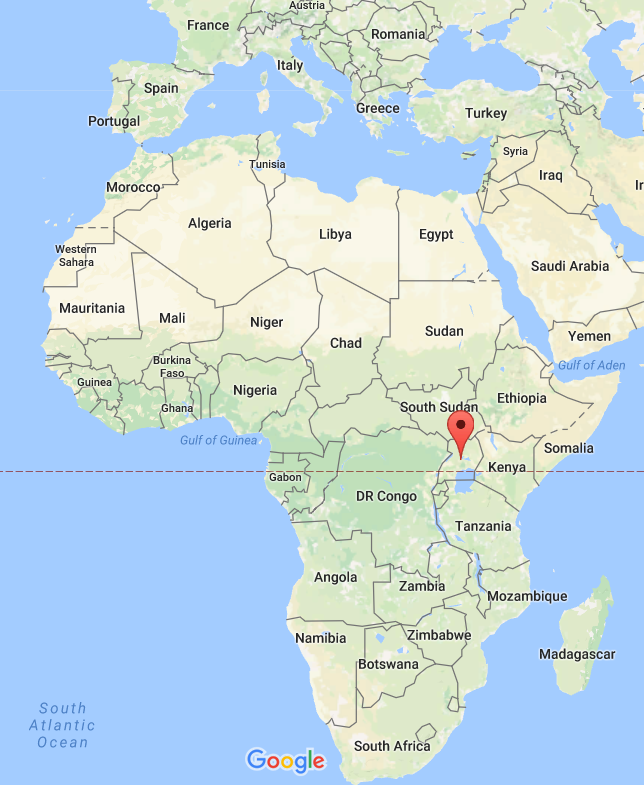 There was nothing particularly obvious that might have signaled that there was a problem, other than the length of time that she remained at the market. Then one evening, Tino found himself purchasing fruit at a fruit stand nearby where the same little hen was. Tino thought to himself how it had been several weeks, and that it seemed odd nobody was buying her. This curiosity caused Tino to walk over to investigate. Upon closer look, to Tino’s horror the hen looked to be in really poor health---she smelled awful, her feathers were ruffled and covered in dirt, her body covered in lice, and she didn’t appear to be moving. Tino asked the vendor who was selling the chicken why she wasn’t moving. The vendor explained how this particular hen was actually one of the survivors----ten of her brothers and sisters had already died. The reason why she wasn’t moving, was because her back toe on her right leg was broken. 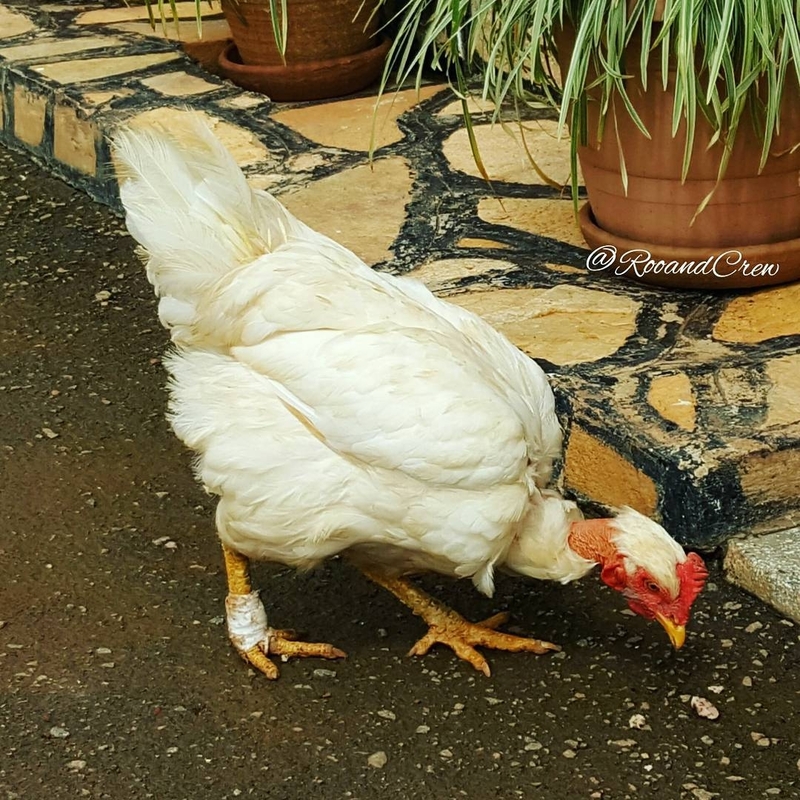 The hen’s toe was broken as a result of her legs being tied together too tight, as she and the other chickens were squeezed in with luggage and foodstuffs (such as bags of cassava and bunches of bananas). The birds received no food or water the entire length of the journey. 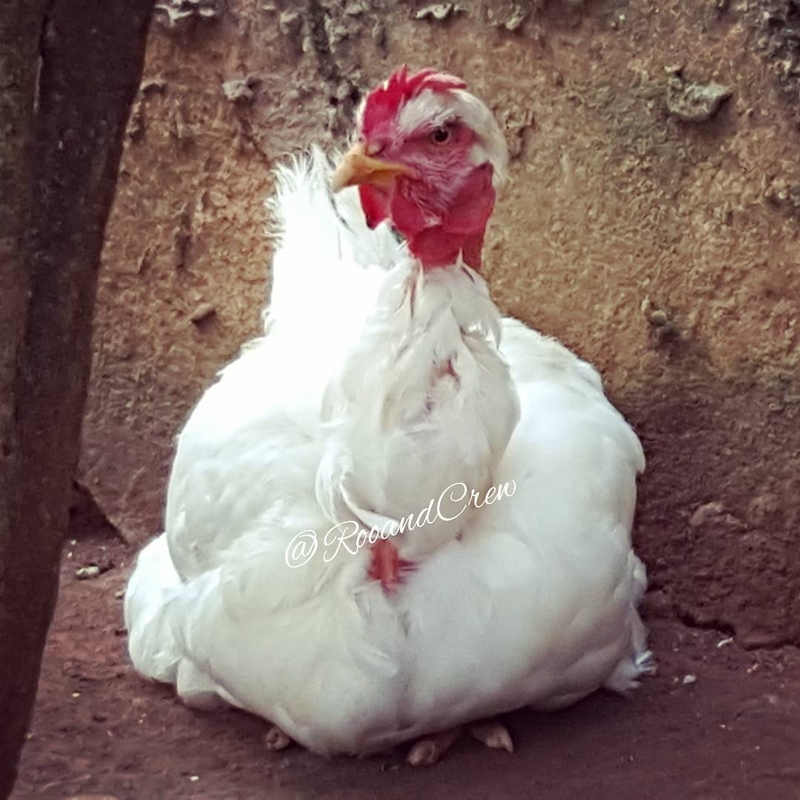 Tino thought to himself, how other chickens from his flock were missing toes and still lived happily….The vendor informed Tino that they were going to try to continue to sell the hen for one more week, and if at that time nobody had purchased her, that they would simply get rid of her. Tino know what this phrase meant. 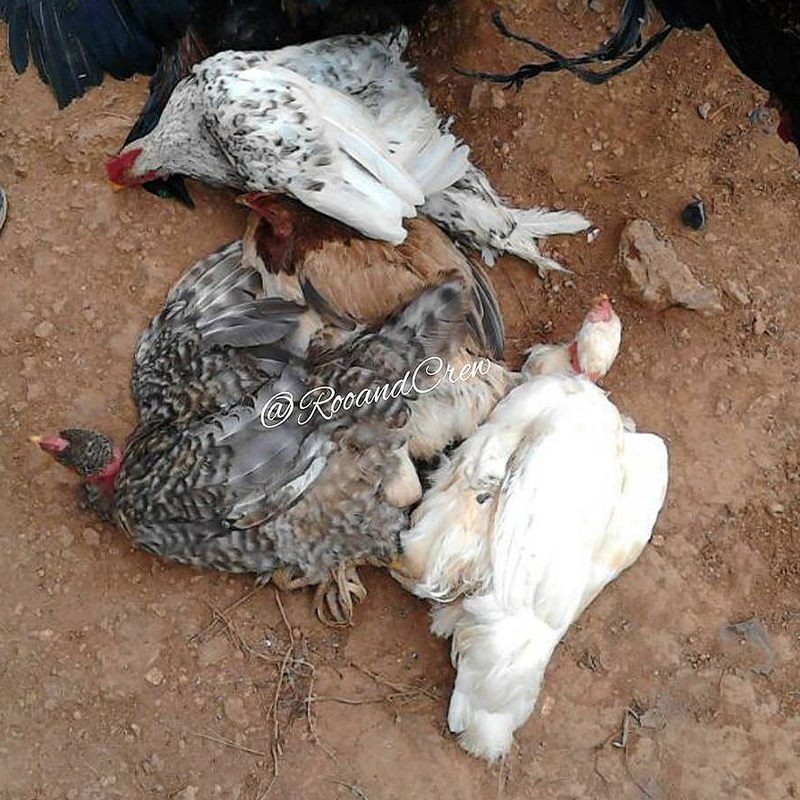 It meant the hen would likely be killed or left at an open dumping site for stray dogs to eat her alive. Tino, having such a good heart, knew that he would never be able to live with himself if he left the hen to an almost certain doom---so he bought the sickly hen from the vendor. On the way home, Tino decided to name the hen, Marvel—for she was a Marvelous little hen indeed to survive such horrific conditions. Upon arrival back home, Tino set up Marvel in a comfortable, secure, and low stress location that was isolated from his other chickens---to reduce the risk of the others getting infected with whatever organisms she was carrying. First, Marvel was given a bath---to help get rid of the lice and clean her dirty feathers. 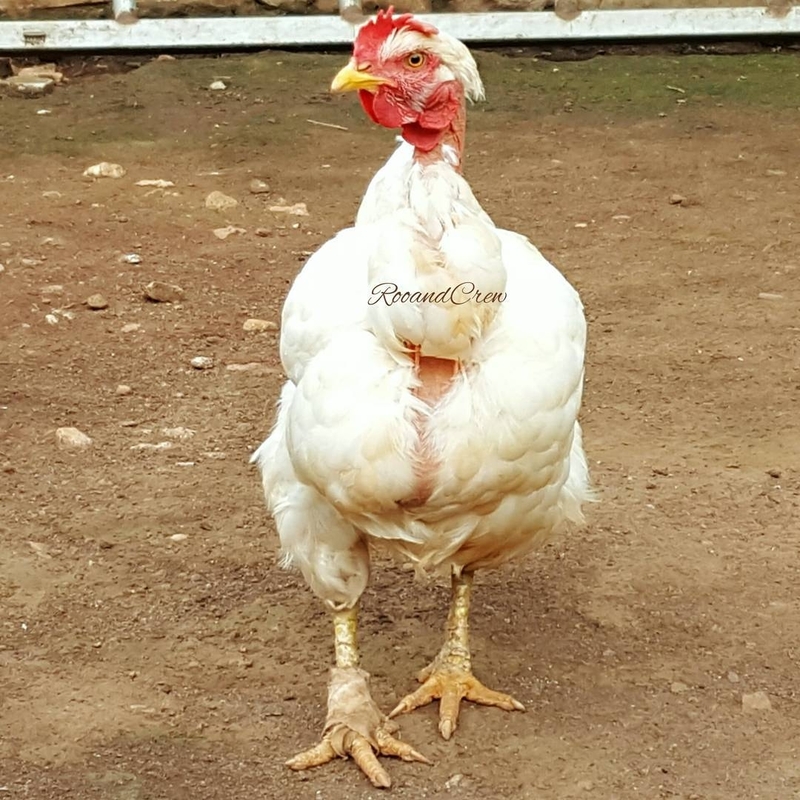 They treated her legs and feet for scaly leg mites, dewormed, and vaccinated her against Infectious Bronchitis (IB) and Newcastle Disease (NCD), as both of these diseases are a concern for chickens living in East Africa. Tino brought Marvel to his veterinarian to get her broken toe looked at. Upon physical examination of Marvel’s foot, his vet expressed doubt about the toe fully recovering, for it was as a bad injury. However, Tino was determined to try---for Marvel had been through so much tragedy---he felt it was time her luck turned around. Be cheap and made with readily available materials. In order to achieve this, Tino looked through the woods for some equally-sized, small but sturdy sticks, and found some adhesive tape in the first aid box. He secured Marvel’s broken toe into place with the two small sticks and tape. He checked on Marvel’s progress daily as changed the splint often. After two weeks of wearing the splint, Tino removed the splint to find that Marvel was walking normal---and on her own! 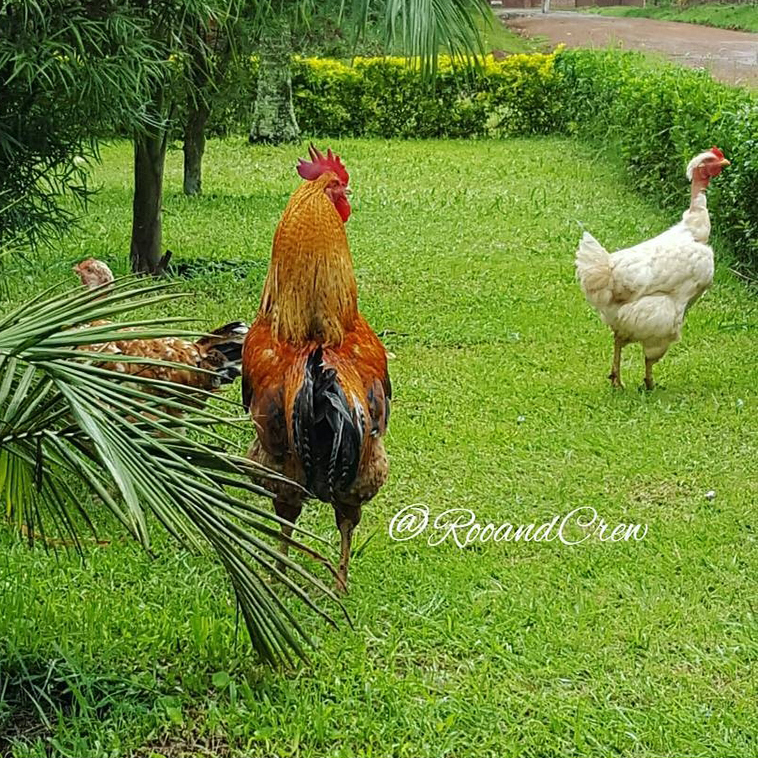 Tino’s Roo and Crew are a family of 30+ chickens living in Uganda, East Africa that are kept as backyard pets. 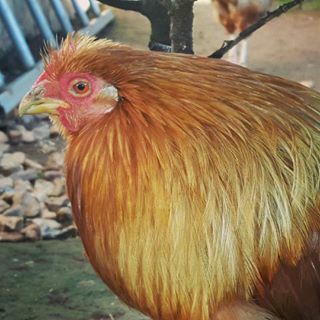 Their flock of birds consist of a mixture of both hens and roosters that are local/indigenous and hybrid breeds. 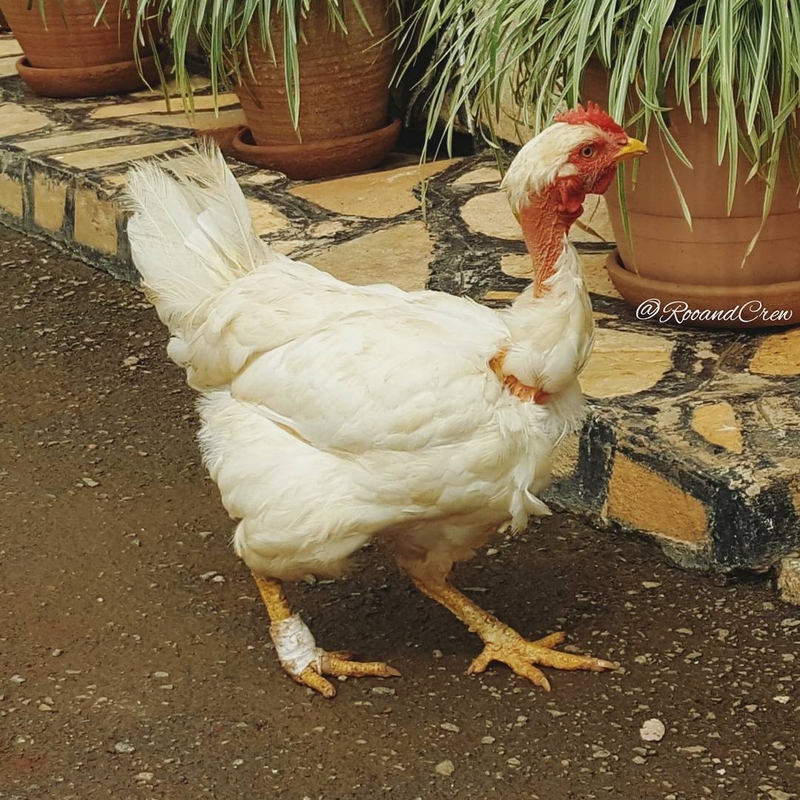 When Tino goes to the market and passes near the chickens section, he often will buy one or two of them in order to save them from getting killed, like in Marvel’s case. 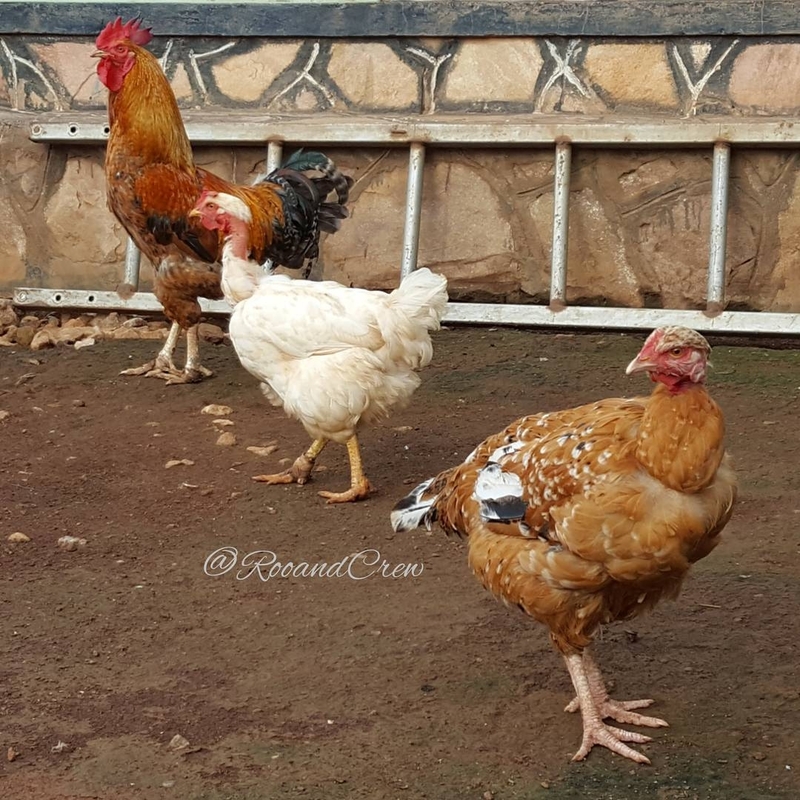 At the moment, there is an outbreak of Newcastle disease close by to Tino’s flock and he is nervous about his flock becoming infected. Thankfully, they do vaccinate their birds against the disease, which means that they won’t die, however they still can get very sick. In order to help build up their birds’ immune systems, they are providing them with additional antioxidants (via fruits like papaya) and multivitamins. Any donations they receive go to helping the birds.